When you're facing a shot that puts you in between clubs, the usual advice is to make a smooth swing with the longer club. I think that works for some players and not others. My own general rule is to go with your first impression, whether that was the long club or the short. Your instinct is usually your best friend. But when your instinct refuses to make a choice - or tells you that you're smack between clubs - the best choice is the one that reflects your tendencies as a golfer and person. If you're what the psychologists call a Type A personality - a hard-driving, impatient sort - you should probably take the shorter club and give it the good aggressive whack you like to use. Tom Watson is this sort of player and he always goes to the shorter club. 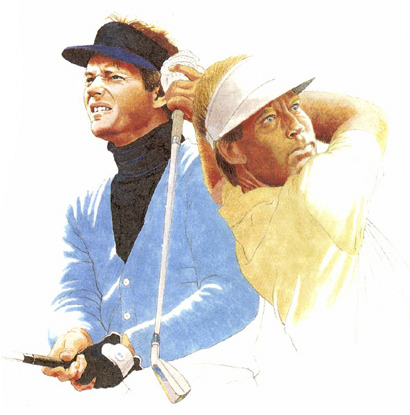 If, on the other hand, you're a milder Type B, more like Ben Crenshaw, with a smooth swing, you'll usually do best with an unhurried pass with the longer club.